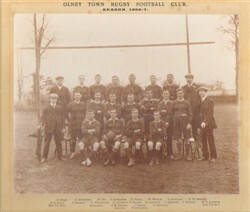 Olney RFC, black and white team line-up photograph season 1906-07, with player names below. Back row: G. Horn, S. Kitchener, W. Dix, C. Kitchener, E. Drage, W. Huckle, J. Longland, F. W. Morgan. Middle row: E. S. Field (Hon. Cor. Sec. ), C. Nichols, C. Wallenger, A. Andrews , F. Harris, H, Andrews, J. Andrews, J. Howson, H. B. Lineham (Hon. Fin. Sec.). Front row: R. Clifton, J. B. Berrill (Captain), J. Simcoe (Vice Captain), H. Millward.